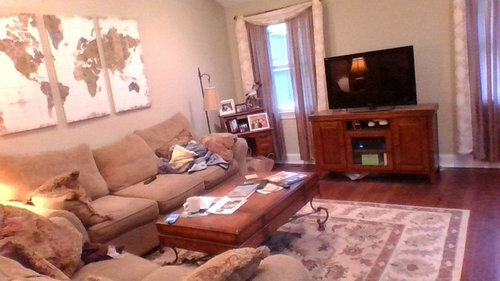 Need to redo our family room and dining area. 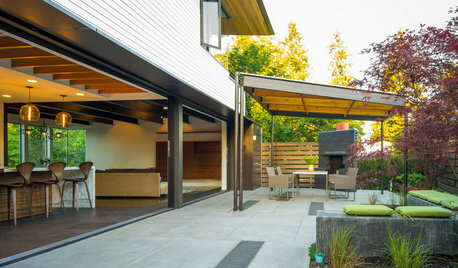 This is one open space connecting kitchen as well. 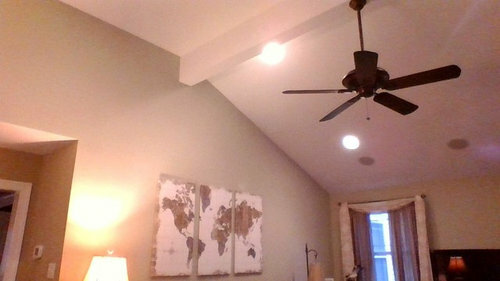 Its a great room with a cathedral ceiling, currently wall color is sage with white trim and ceiling. 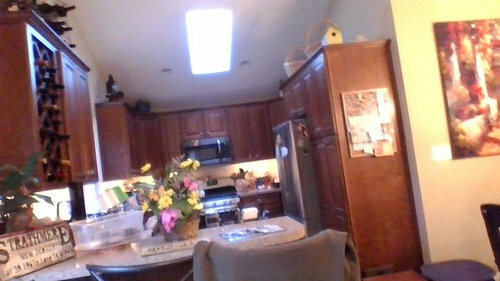 This color is thruout the whole room, including the kitchen. The mantle of the fireplace is reclaimed black walnut. 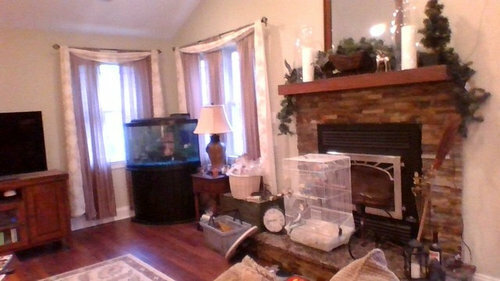 FYI, the bird cage is not normally in front of the fireplace. I really want to add more family photos, though they are not professionally done. 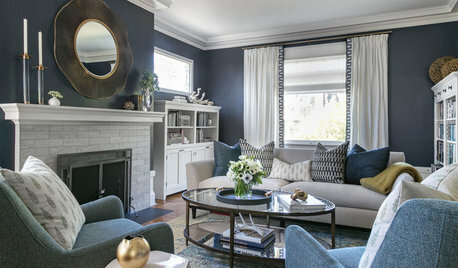 I'll take any and all ideas for paint colors, decor change. I want to add more color to the room, change the overall wall color. Hard to respond to your request unless we know what you're attempting to achieve. What's bugging you about the current look? Do you want to go more modern? Transitional? Or just a more up-to-date traditional look? 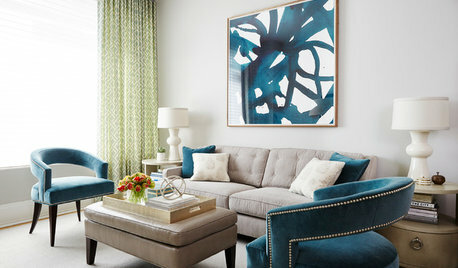 Have you started an idea book here on Houzz to pull photos you like? Give us a place to start; this is a bit too open-ended. 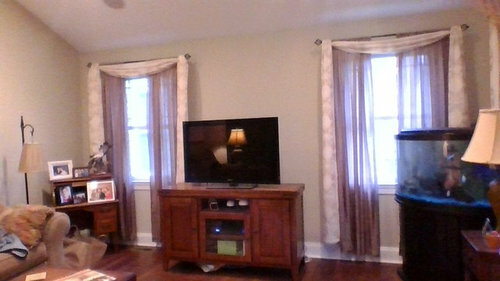 Family room/9 ft. bar area for family dining and fireplace enjoyment. Here are some funky fun plate arrangements for the wall / fireplace. 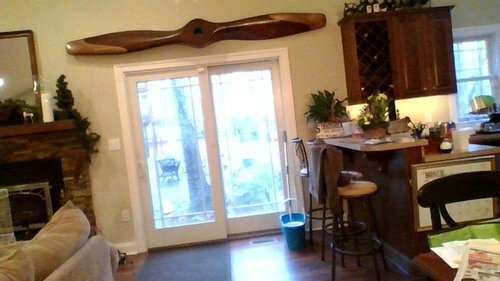 http://www.houzz.com/funky-plates-on-wall. 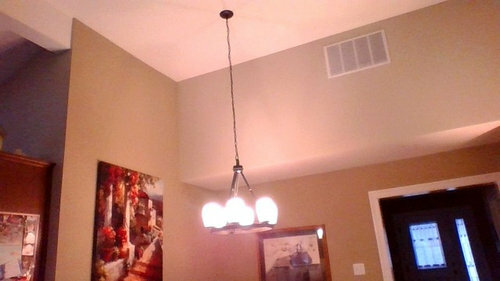 Here are 2 fireplace photos with plate arrangements. 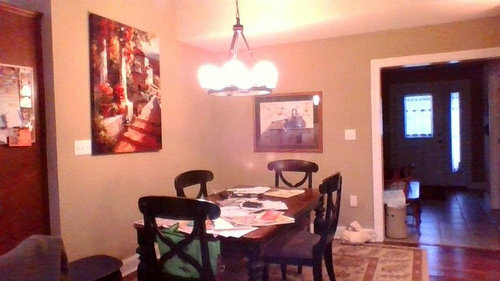 I would like to open up my dining room to the family/great room. Any ideas? Angelina -- Perfect. Then, you can delineate space with the wood running in different directions. Or, frame the area for the dining table with an inlay. So many possibilities. I think it would look great opened up. You will have to play with layouts. 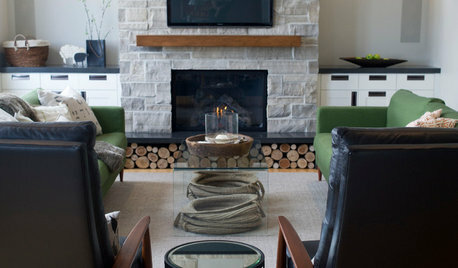 You will even be able to balance the space so that the off-center fireplace will look amazing. Great family party space. 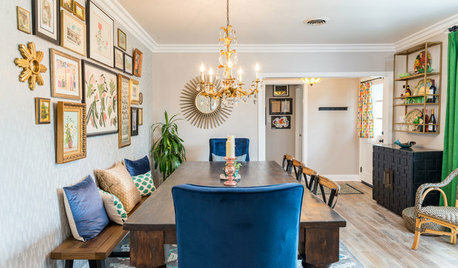 good idea to switch dining room w/ family room? er612 thanks so much! What program are you using? Wall right next to fireplace is almost 5ft; wall adjacent is 6.5 ft till reaches window. TV =53&quot;. Besides minimal wall space a support beam runs across but is not centered over FP, it runs at the end of the right side of hearth. There is also an entryway next to the fake Matisse. 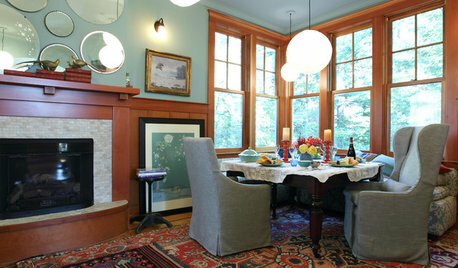 Remove the window treatment for a start, which are outdated and are not letting in the light you need. I would remove all the accessories which are too busy and make the room look chaotic and cluttered. After you do this, perhaps you can repost photos of just the furniture in the room here so we can make good comments to achieve your look. There's a lot of cleaning equipment and misc. stuff that confuses the viewing. Recs for medium, brown stains on red oak? Samples going down tomorrow!